LAS VEGAS, Nev., June 2, 2011 (SEND2PRESS NEWSWIRE) — Extensoft announced today the immediate availability of Artisteer 3 for Windows. The newest version of its Web design automation software, Artisteer 3 distinguishes itself by enabling website owners to create professional looking websites from start to finish. Artisteer now delivers a single solution for web design, content management and web hosting. Users can continue utilizing Artisteer’s powerful web design features to create impressive website templates, then move onto creating pages and editing content for their website, ending with publishing their website to a web hosting account. 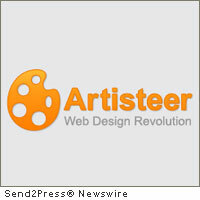 Artisteer 3 also expands the range of its web design features for Joomla, WordPress, Blogger, Drupal and DotNetNuke users. – Solution for hosting finished websites and maintaining them via a web-based management interface. Artisteer eliminates the need to learn Photoshop, Dreamweaver, HTML, CSS or other Web technologies to produce professional and original Website designs. The finished designs can be output in variety of CMS formats, such as Joomla template, WordPress theme, Drupal theme, Google’s Blogger template, and DotNetNuke Skin. Support for Microsoft SharePoint is also available as a Beta release. The design automation, variety of design elements, and precision control features wrapped in an intuitive interface, enable everyone from technology professionals to the average blogger with little or no technical experience to quickly build professional presence based on validated HTML and the smart use of CSS. Artisteer was built using a thorough standards-based approach with support for XHTML and CSS output, W3C color contrasting and Section 508 standards. Extensoft’s groundbreaking engineering also minimizes page load times by utilizing advanced CSS-based technologies that decrease the number of images used for displaying buttons, rounded corners and other design elements. Artisteer also solves many Web browser compatibility and technical problems facing professional Web designers today, making it an essential Web design tool for professionals and amateurs alike, no matter how simple or complex the project. Artisteer allows everyone to be able to create impressive websites without the added expenses of CSS template purchases or hiring third parties. Artisteer runs on Windows 2000/XP/Vista, is priced at $49.95 to $129.95 per user, and is available now at www.artisteer.com . Extensoft is also working on Artisteer 3.0 for Macintosh computers, currently available on its website as a Beta product. Extensoft is a consumer software publisher with the goal of bringing creativity and productivity to computer users worldwide. Extensoft is located in Las Vegas, Nevada. Original Keywords: Extensoft Inc, Web design automation software, Artisteer 3, web design, content management and web hosting, designer, CMS, wordpress templates, drupal, dotnetnuke, blogger, joomla designs, page layout, CSS, W3C compliant pages, Nevada business news Extensoft, Inc. Las Vegas Nevada LAS VEGAS, Nev.
REFERENCES: Communication Arts News, Extensoft Inc, Web design automation software, Artisteer 3, web design, content management and web hosting, designer, CMS, wordpress templates, drupal, dotnetnuke, blogger, joomla designs, page layout, CSS, W3C compliant pages, Nevada business news Extensoft, Inc. Las Vegas Nevada LAS VEGAS, Nev.